To further expand its security offerings for the home and business, SecureAPlus is now available on Android to protect mobile devices against malware and viruses. 1 June, Singapore – SecureAge Technology releases SecureAPlus Antivirus for Android bringing its patented multiple cloud engine scanning technologies along with other mobile security features to Android phones around the world. Recently coming off of extensive rounds of Beta testing from its growing user base, the SecureAPlus Antivirus for Android is packed with useful security features that not only protect mobile devices but also serves as an extension of the protection technologies that it uses to safeguard PCs all over the world to mobile devices. It features the SecureAPlus Universal AV, the patented technology that allows for multiple antivirus engines in the cloud to scan your device without minimal impact on performance and bandwidth. It covers both file and application file scanning using more than 10 antivirus engines in the cloud at the same time to provide users with a comprehensive diagnosis of a potential threat. The app also includes an App Locker to ensure app privacy from any other user who manages to gain access to the phone. The applications of the feature extend well beyond privacy as it can also be used as parental controls for any Android Phone. Authorized users get the option of locking and unlocking apps using either and number lock or a pattern lock code to protect their messages, photos, videos, and more. As an extension of the SecureAPlus for PC and the SecureAPlus Portal from the web, the app also allows users to monitor and even manage their endpoint security through alerts and whitelist request from the comforts of their phone, anytime and anywhere. SecureAPlus for Android is now available as a free download on the official Google Play store. Users who already have a SecureAPlus Account with a Premium License can enjoy additional features that help them manage and secure multiple devices. For a limited time only, all users who download the mobile app and log in to their SecureAPlus Account via the app will receive a free 6-Month SecureAPlus Premium license so they can enjoy the added features of the app at $0 upfront cost up to a maximum of 3 PC devices. 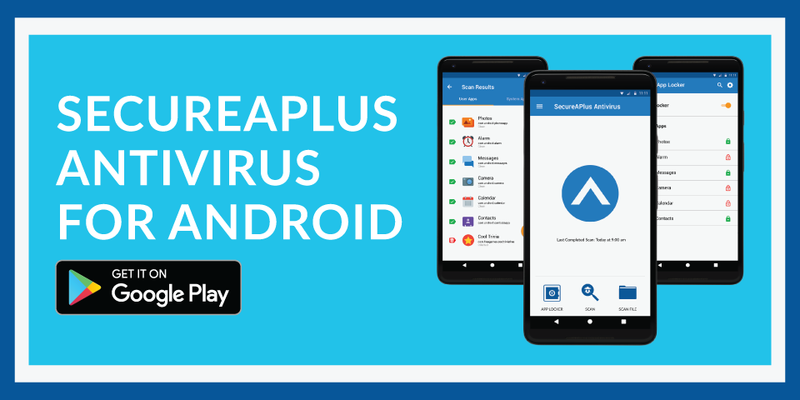 SecureAPlus Antivirus for Android combines 10+ anti-virus engines in the cloud to help protect your mobile device against the latest mobile threats such as viruses and malware. Immediately gain access to a comprehensive diagnosis from the industry’s most exceptional scanners in the cloud without slowing your Android device down for free. It is available for free download on the Google Play store. SecureAPlus is a free security software developed by SecureAge Technology that protects PCs from malware & viruses with its powerful but easy to use Application Whitelisting, and reliable detection rates of more than 10 cloud Anti-Virus engines with Universal AV. It leverages the power of the cloud allowing for low resources used and compatibility with other installed anti-virus and anti-malware applications, making it the perfect security upgrade for any Windows PC.